Suzanne Somers was handed a death sentence in 2008. Her oncologist gave her the gut-wrenching news that she had cancer, and it had metastasized throughout her body. During six days in the hospital, six different doctors confirmed the grim diagnosis and said her cancer was inoperable, incurable, and hopeless. On day six, however, the doctors realized they had made a terrible mistake. Somers, who had already fought a successful battle with cancer ten years before, was actually cancer-free. The result was her book, Knockout: Interviews with Doctors Who Are Curing Cancer and How to Prevent Getting It in the First Place. This book features Suzanne's interviews with doctors and health professionals who are having success with the most innovative cancer treatments . These treatment protocols include everything from conventional to integrative to alternative methods to combat this deadly disease. Somers doesn't preach. She understands you may want to use standard mainstream treatment. That's your choice. In fact, you'll also find excellent advice to help you if you undergo chemotherapy and radiation . . . advice that can improve your odds of survival dramatically. Yet, no matter which path you choose, this book will help you navigate the life-and-death cancer puzzle — and boost your odds of surviving a cancer diagnosis. Plus, because prevention is your first line of action, Somers' experts give you nutrition, lifestyle, and healthy supplementation options to help you from getting cancer in the first place. We've spent billions of dollars fighting cancer during the last 55 years, Somers says, yet there is no cure. "Perhaps we've been barking up the wrong tree," she says. "Maybe these doctors who have broken away from standard care are onto something. 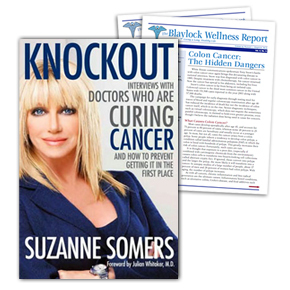 "Writing 'Knockout' took away my fear of cancer," Somers said. "There is another way."